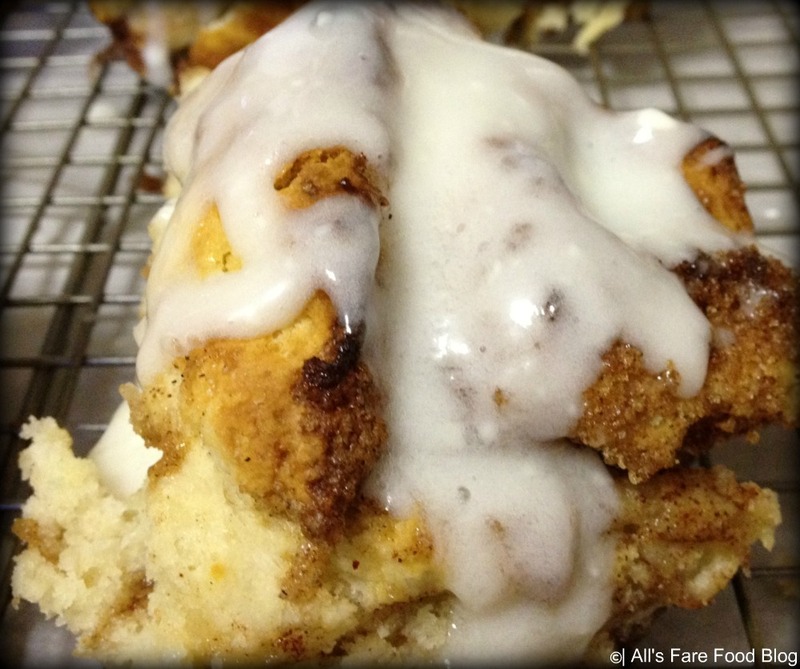 The result was an airy, sweet and cinnamony delight that took a little more than an hour from start-to-finish, and, I didn’t have to fight my fear of yeast. Preheat oven to 425 degrees; adjust oven rack to upper-middle position. Melt all of the butter you will need for all of the recipe at once, then measure out as you need it. Next, brush a cake pan with 1 tablespoon melted butter to coat. I actually used a 9-inch pie plate here. You’ll also want to spray a wire cooling rack with nonstick spray and set aside. Next, you’ll put together the cinnamon-sugar filling. Combine sugars, spices and salt in a bowl. Add 1 tablespoon melted butter and stir with fork until mixture resembles wet sand; set filling aside. Now, we go on to the dough. To start, whisk together the flour, sugar, baking powder, baking soda and salt in a bowl. Then, whisk buttermilk and 2 tablespoons melted butter in a small bowl. Add liquid to dry ingredients and stir with wooden spoon until liquid is absorbed (dough will look very shaggy), about 30 seconds. Transfer dough to lightly floured work surface and knead until just smooth and no longer shaggy. Now, we’ll put everything together to make the rolls. First, pat dough into 12 by 9-inch rectangle. Sprinkle the filling all over the dough and press into it. Then, from a long end, you’ll start rolling. This is where I had issues. I think I may have worked my dough too much in the previous step – because it was way sticky and was breaking apart, even with adding extra flour to my hands and the wooden work surface. You will want to roll it up as well as you can and then cut into 8 segments. Place in the cake pan and brush with 2 tablespoons remaining melted butter. Bake until edges are golden brown about 23 to 25 minutes. Loosen with a spatula and slide onto the cooling rack. Let cool about 5 minutes before icing. 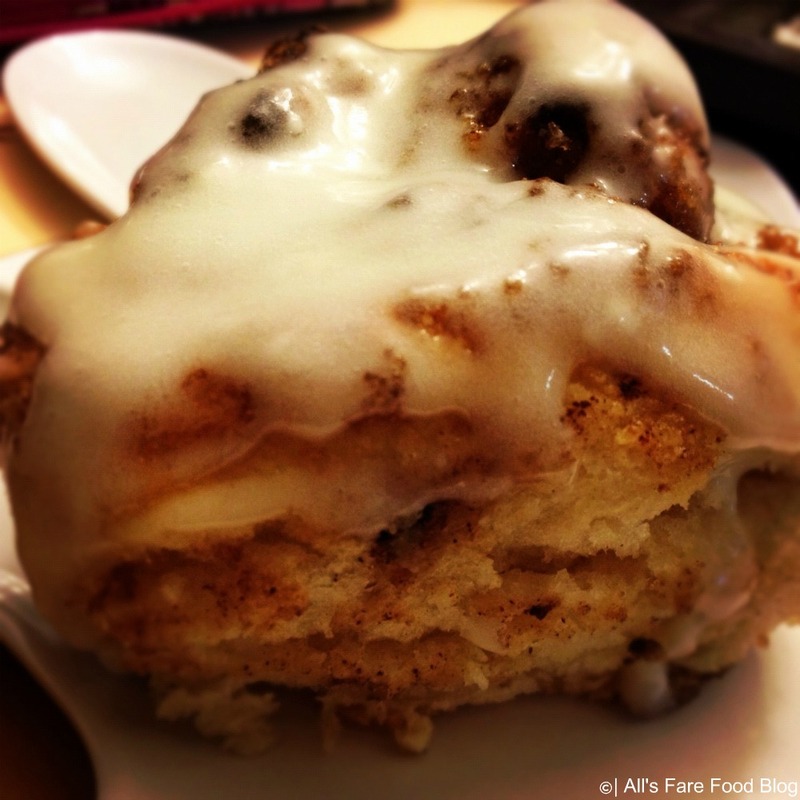 While the buns are cooling, you can put together the icing. First, line a rimmed cookie sheet with parchment paper and set the cooling rack on top. Next whisk together softened cream cheese and buttermilk together. It will look a bit like cottage cheese. Then, sift the powdered sugar over the cream cheese/buttermilk mixture and whisk for about 30 seconds. Spoon glaze evenly over buns and serve immediately. These are best eaten right away but they can be good as much as two hours later. 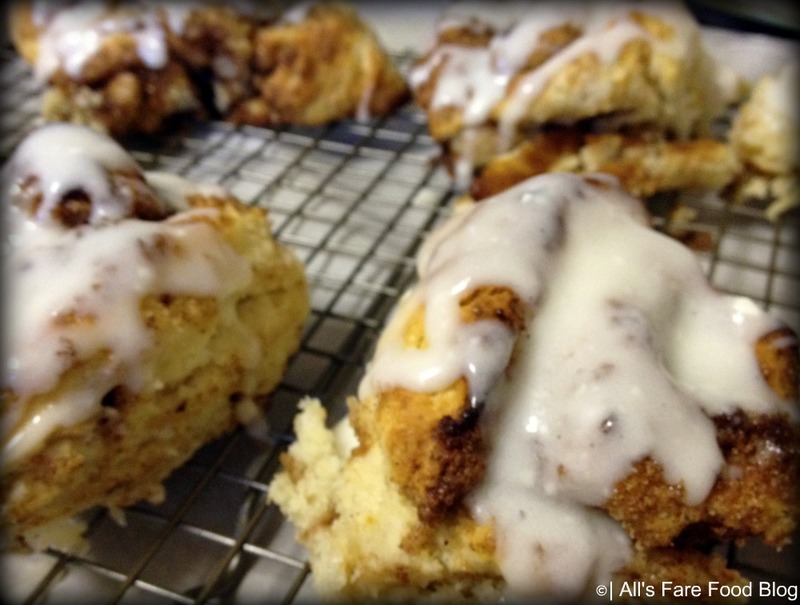 This entry was posted in Cuisine - American, Recipes and tagged America's Test Kitchen, buttermilk, cinnamon, cinnamon rolls, icing, recipes, yeast breads by Christina. Bookmark the permalink. I made these on Christmas morning. I had made them a few years ago and decided that baking them the day before they are even better. I made them and baked them on Christmas Eve, then made the icing, reheated them, and poured on the icing right before serving. Everyone raved about them! Wish they lasted long enough to try the next day! This sounds incredibly unique and it looks incredible. My husband has had me looking for a whole wheat version of this recipe. Thanks for sharing this one!